"Help! I found a baby turtle in my yard. It is so adorable. I had to pick it up and take it inside. I want to keep it, but people tell me I should release it. Is it against the law to keep it? I don't know what to do." This is the essence of many emails we receive. Perhaps more so than any other wild animal encountered by people, turtles are frequently picked up and become pets if only temporarily. Many of these encounters are by people who never had a turtle as a pet before. Some of these people search the internet, find TurtleTails.com, and ask us for help. We always respond. Let us begin by dividing this subject into two general categories - being a good samaritan who relocates a turtle and keeping a turtle for a pet, especially a baby turtle. Yes, the good samaritan often becomes a pet owner. This even happens to us. Case in point - Emily. Emily is a large Florida red-bellied turtle. She was found on someone's doorstep in Pennsylvania and turned over to a wildlife rescue organization by a good samaritan. We were contacted to help identify her. They knew she was a red-bellied turtle but were unsure of the exact species. 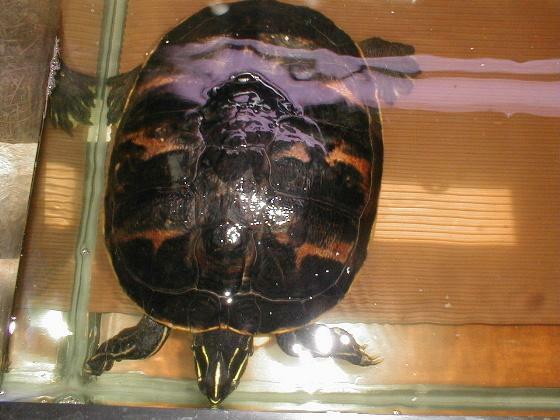 There is a species of red-bellied turtles native to southeastern Pennsylvania. By law the rescue organization must return native species to the wild and may not release non-native species in the state. We identified her and asked for permission to photograph her. The response was "Will you take her?". This was a departure for us because we had only been keeping turtles that could hibernate. The Florida red-bellied turtle is only found in Florida and limited parts of Georgia where it may be active all year. Of course we did not hesitate to accept her along with two small red-eared sliders. We knew we could find homes for the sliders and thought about finding a ride to Florida for Emily. The folks at the rescue organization named her Emily. She is 11" long and weighs eight pounds. It was late summer when Emily joined us. From the start it was clear that Emily was very comfortable in captivity and a domesticated turtle not a wild turtle. Releasing her in Florida was not the answer. From the start she loved sitting by our small turtle pond with other turtles and followed me around demanding attention whenever I entered the pen. I never had a turtle follow me around like Emily did right from the start. And it was time to prepare for winter. In October she came inside with our other water turtles and was placed in the hibernation quarters temporarily (See Tour 11 on the Raising Baby Turtles page). This was only a temporary solution because we were not prepared to subject her to a long winter hibernation. After several weeks with the other turtles in our basement we prepared a 30 gallon breeder aquarium for her. Then after several weeks in the aquarium we established a workable routine for feeding and running the house. This is also described in Tour 11. So our intention to be a good samaritan resulted in a new member of the family. We have no regrets and would do it again. The point we wish to make is that simply relocating a turtle to a place you think is a better place for it may be a death sentence. Emily most likely would not have survived a Pennsylvania winter if she had been dropped into a local lake. It's better to identify the species of turtle first before relocating it. We are happy to help the many viewers seeking to identify turtles. Part of the reason this web site was created was to provide better pictures for identifying turtles. It is not necessary to identify a turtle you help cross a road safely. There is something about how people react to finding a turtle that we wish to make you think about. We read and hear about the destruction of turtle habitat all the time. We are conditioned to think that turtles must be out "in the wild" somewhere, that they can not survive in our yards, that a turtle in our yard must surely be lost. People who find turtles in their yards or in their neighborhoods immediately think they must relocate the poor turtle. Why can't the turtle live a good life in your yard. Rabbits and birds do. After all the wild places are full of animals that eat turtles. Most carnivorous animals in the wild will eat a turtle or harm it if given the chance. Your yard may be a much safer place even with dogs and cats around. 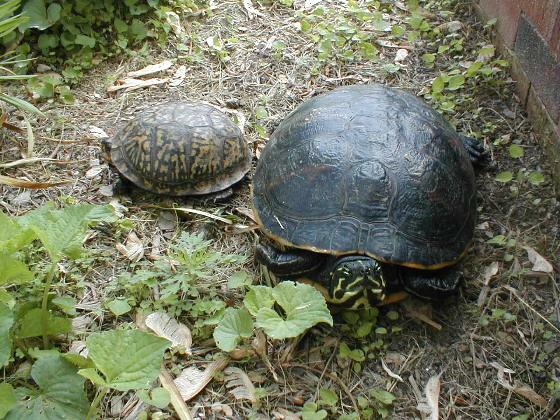 It is common for people living in urban areas who have fenced in yards to have turtles roaming freely in their yards. They may or may not feed them. People in suburban neighborhoods may find turtles inhabiting their yards too. Their neighborhoods may have been part of the home ranges of the turtles before the houses were constructed. It has been proven that turtles have some ability to return to their home ranges when displaced short distances. Moving one of these turtles may result in the turtle seeking to find its way back. Female turtles frequently travel long distances to find the right nesting sites. This is often in yards. This leads to more encounters with people as babies hatch and emerge from their nests. The female turtles may slip in and out of the yards undetected, but the babies will not travel far. Who can encounter a baby turtle in their yard and not pick it up. And turtles nesting in your yard means that your yard is turtle habitat. Baby turtles can grab your heart. They are so very adorable and so very defenseless. Everything is out to eat them so they must hide constantly. So when baby turtles are encountered, there is a natural tendency to pick them up for their safety. They are much harder to put down. People who never thought of having a pet turtle often fall in love with baby turtles. We have no issues with people keeping baby turtles and we try to help by showing how we care for our baby turtles via these tours. The same goes for larger turtles. And why is it that frogs, toads, salamanders, lizards, and snakes do not spark the same reactions from people. When you fret over the turtle you have recently acquired, consider how you would be reacting if it were only a toad or salamander. We would never advise anyone to break the laws of their states pertaining to turtles. However, most people do not fully understand their state laws and make statements that are incorrect. This often causes anxiety for people who just found a turtle and are thinking about keeping it. If you are one of these people who found a turtle, properly identify the species before worrying about anything else. We can make some broad statements that apply to most states. First it is commonly against state laws to disturb nesting turtles and to disturb nests of eggs in the wild. This does not apply to captive turtles. Secondly it it generally against state laws to release non-native species into the wild including recently captured non-native turtles. 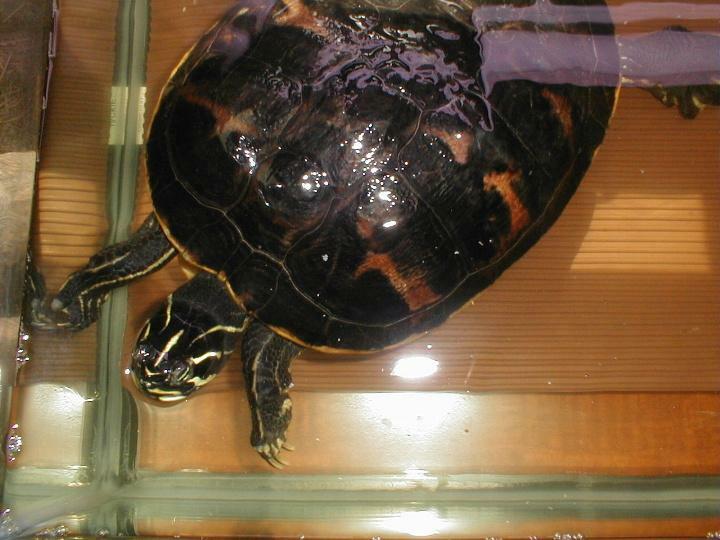 It is also against many state laws to release long captive or pet turtles into the wild. Statements similar to these are common even when the laws do not exist. In most states the word "pet" is never used with the word "turtle" in state regulations. 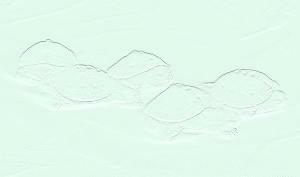 The word possession is often used which refers to dead or alive and parts or whole turtles even turtle shells. Think of possession as you would about a trout a fisherman catches and intends to eat. Many states elaborate on allowing people to help turtles cross roads safely. We have never seen a reference to prohibiting motorists from intentionally driving over turtles on the road. We suggest your read your state laws yourself and draw your own conclusions rather than listen to hearsay and misinformation. We find that among friends who are avid amateur herpetologists and keepers of reptiles and amphibians that there is considerable misinterpretation of the laws. Conversations I have had with state fish commission officers concerning our state laws also leads me to believe they are just as confused. We do recommend strict observance of the possession limits when out in the field or transporting turtles from the wild. Okay! You have a turtle for some time and you decide you will not be keeping it as a pet. Now what? Many people relocate them "to the wild". Water turtles are easy to place in a body of water. Land turtles are easy to place in a woods or field. We say why not consider placing the turtle in your yard if that is where you found it providing it is a native species capable of surviving your winter conditions. If it is not a native species, it is better to find a home for it. Let's complicate this issue further. As newly weds we picked up a baby snapping turtle and took it back to our college apartment. After several years we purchased a house and a dog and then had two children. The snapping turtle grew to a large adult in eight years. It got along well with our dog and very seldom ever climbed out of its 125 gallon aquarium. It was our only turtle. But it was also an eating machine and was very aggressive if it thought someone had food for it. After our second child was walking, I realized that eight years of good memories could have a sad ending if it took hold of one of our children. There was no stopping the turtle from climbing out of the aquarium at will. I decided that we would release it in the Susquehanna River near our home. The river is a mile wide snapping turtle heaven. The day came to release it. It was evening and rain was coming. Our children who had never handled the turtle were sobbing. Our dog was with us. I figured that the turtle would taste the river water, begin to explore it, and slip away in doing so. Boy was I wrong. I placed the turtle (named Turtle) into the muddy river near shore. It sat there looking at us and did not move. It did not taste the water or show any interest in the river even though it had enjoyed eating many fish that had come from the river. It just sat there and looked at us, it's family. Rain drops began to fall. Not wanting to leave Turtle sitting so close to the bank, I pushed him out beyond reach. He still sat there and looked at us. We finally left "abandoning" our beloved Turtle. This was not a release; it was a pet abandonment. It still troubles me to think about it. The fact is that our adult snapping turtle had no desire to be "released". He did nothing to leave us even when placed it prime snapping turtle habitat. He didn't understand. I didn't understand. I am sure Turtle buried himself in the mud for an extended period of time and then thrived in the excellent habitat. But was he happy or better off. It was another decade before we had another turtle in the family. So what should you do with your newly acquired turtle? You should do what you want to do and not what someone else tells you. Sure you need to learn how to care for it. TurtleTails.com is a good place to learn that and we will answer your questions if we can. Remember that turtles are capable of bonding with you which is way they make great pets. And like any pet, you can find them a new home later if your situation changes. 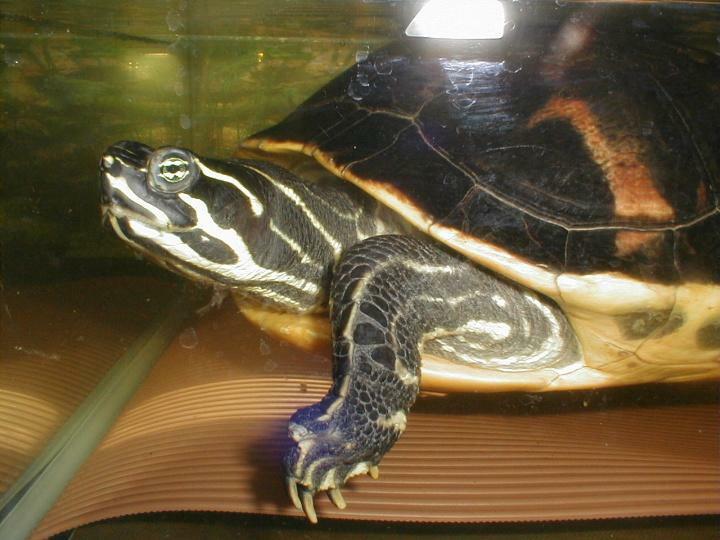 Most young turtles adapt well to life in captivity and many adult turtles will adapt well to captivity over time. 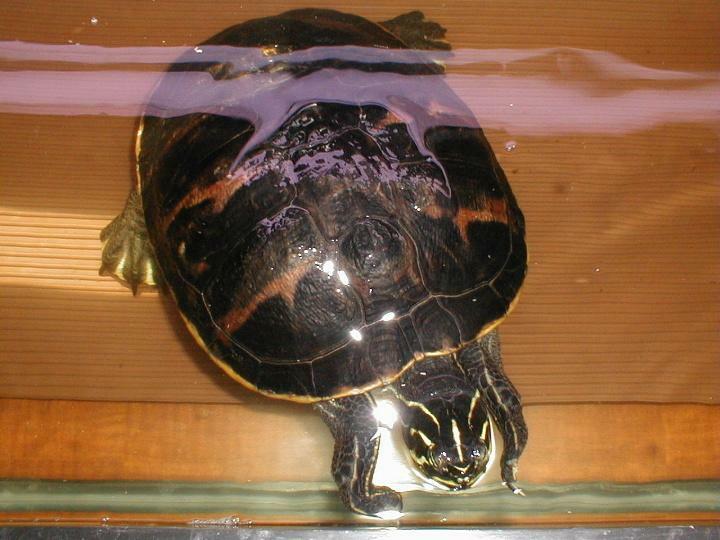 Some adult turtles are very uncomfortable in captivity and will show it. 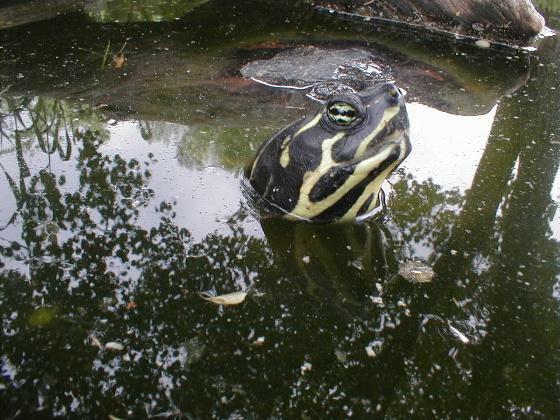 Turtles not native to the area they are found in may have been pets before and may do very well in a new home. So if you pick up a turtle you find and you take it home, don't fret over it. Start by identifying the species of turtle correctly and go from there. And remember that a turtle is no different than any other animal you could adopt as a pet. One last thing about baby turtles. Baby turtles have a very small chance of surviving in the wild. Many eggs are destroyed by animals such as raccoons. Many that manage to hatch are eaten. Raising a baby turtle for a year to help it along is call "head starting". This helps a turtle survive and grow so it is more able to make it on it's own. We find that baby turtles do not bond much with us their first year. So if you do find a baby turtle and you take it in to try it as a pet, you will be greatly improving it's chances of survival. If you later release a healthy young turtle, you have given it a head start in life. If you continue to keep it as a pet, your home will be it's home. We hope we have helped you by giving you our perspective on this subject and we hope you enjoyed our fourteenth behind-the-scenes tour.